Valve’s annual Steam Autumn Sale (also known as the Black Friday sale) kicked off moments ago with deals on more than 6,700 titles, many of which are quite significant. Highlights include 60 percent off Dark Souls III (now $23.99) and The Witness (yours for $15.99), half off The Evil Within 2 (down to $29.99), 75 percent off Warhammer: End Times – Vermintide (now just $7.49) and 40 percent off Aven Colony (priced at $17.99). There are also deals on several franchise titles. For example, you can score savings of up to 87 percent on games from the Resident Evil franchise, 80 percent off titles in the DiRT family of games and 75 percent off select Fallout entries. You can also pick up Left 4 Dead and Left 4 Dead 2 for a combined $2.98, an excellent deal on two great games. Those on a tight budget may want to check out Steam’s “Under $10” section for deals like 40 percent off Terraria ($5.99), 50 percent off Rust ($9.99) and Rocket League ($9.99) and 75 percent off Europa Universalis IV ($9.99). Steam also has several free to play games including World of Warships, Unturned, Heroes & Generals and Life is Strange – Episode 1. 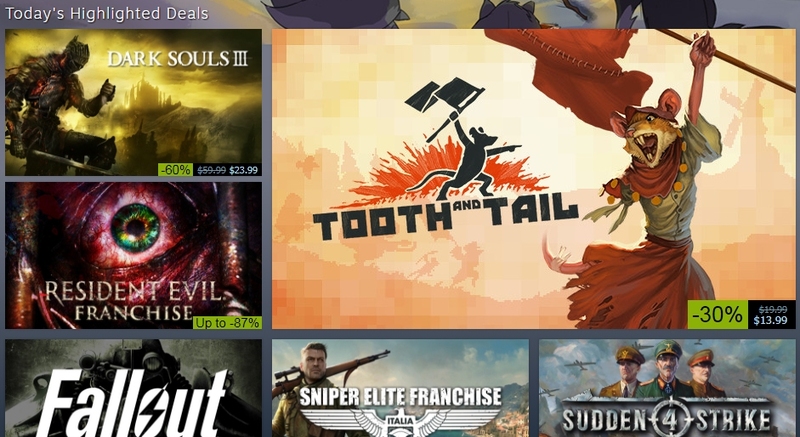 The Steam Autumn Sale runs through November 28 at 1 p.m.